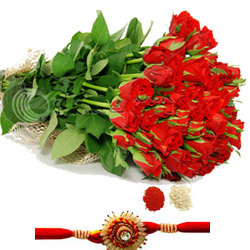 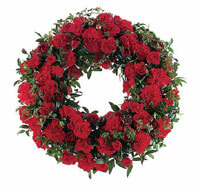 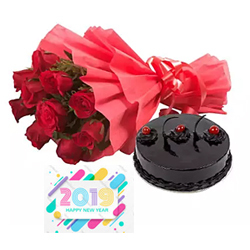 Red Roses Wreath to convey your heartfelt condolences. .
Ugadi Hamper 1 : 1kg specially packed Assorted Sweets + 12 red roses bunch + Ugadi Wishes message. .
Ugadi Hamper - 2: 1kg Special Ugadi Cake (Egg less Cake) + 12 red roses bunch + Ugadi Greeting Card. 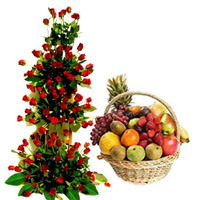 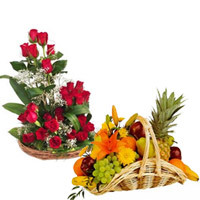 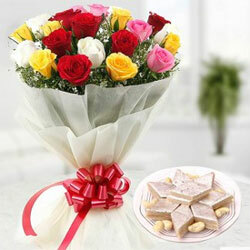 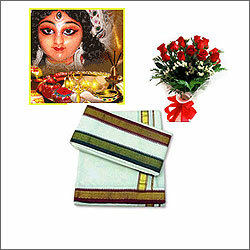 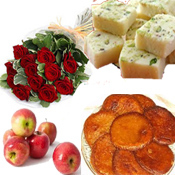 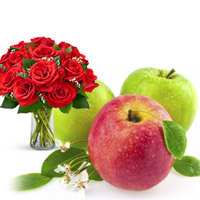 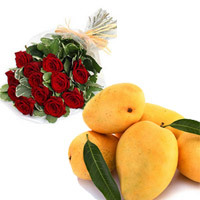 Ugadi Hamper - 3: 1kg Rava Ladoo Sweets + 12 red roses bunch + Ugadi Wishes Message. 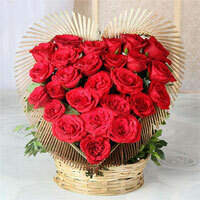 Two Red Hearts As One Basket . 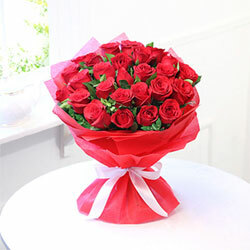 Red roses show your love in an unspoken way. 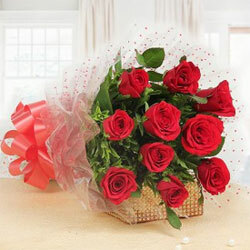 Red roses show your love in an unspoken way. 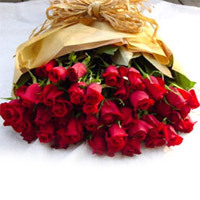 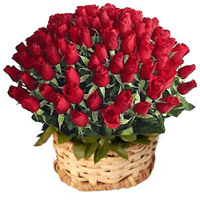 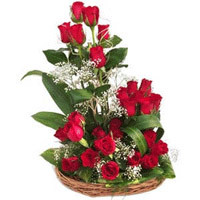 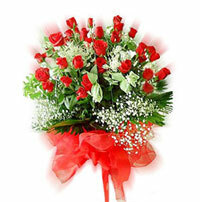 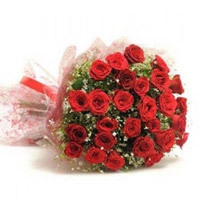 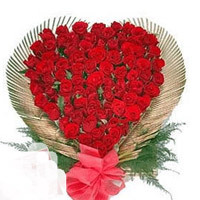 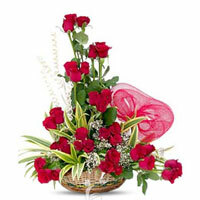 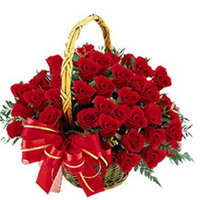 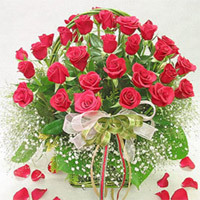 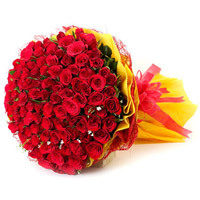 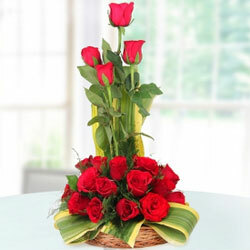 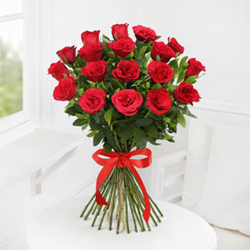 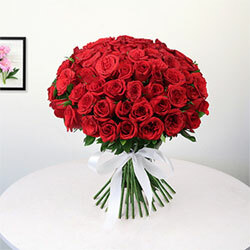 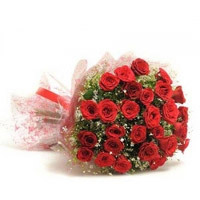 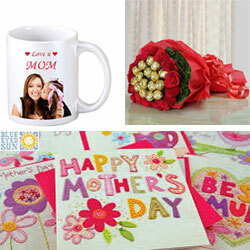 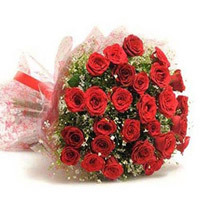 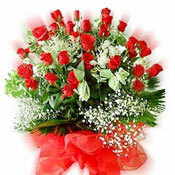 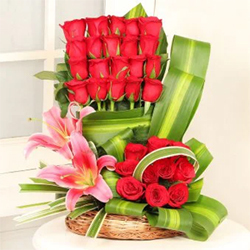 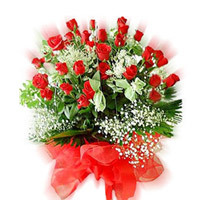 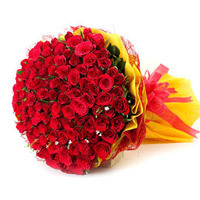 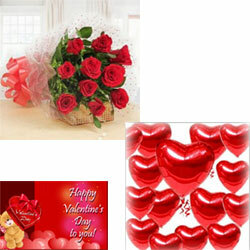 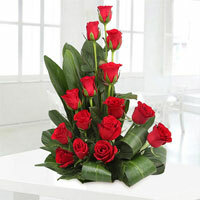 You can gift this lovely arrangement of red roses to the people you love. 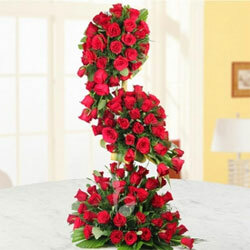 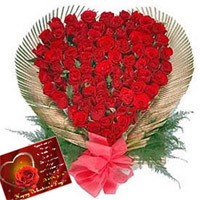 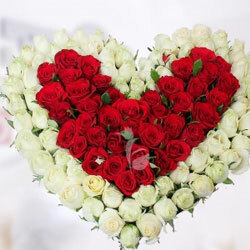 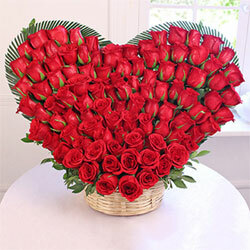 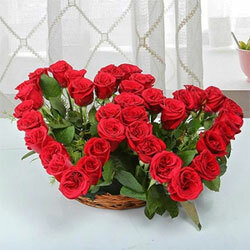 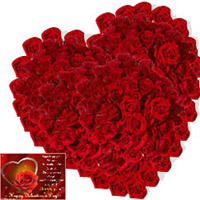 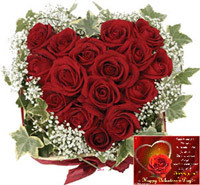 37 red roses are arranged in the shape of two hearts so it expresses your emotions to your loved ones.. 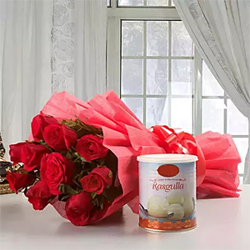 Description: 12 Red Roses bunches (2no) specially made to express your heart felt wishes to the couple on their most special day..
Hamper includes 2018 Executive Diary + 12 fresh red roses bunch + Greeting Card. .
Express your gesture in sweetest way with this hamper of 10 Red roses and a 1kg rasgulla tin. 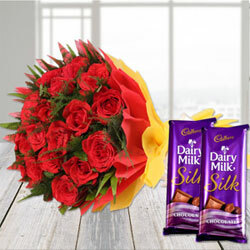 It is a pretty combo designed to mark the happy moments..
A chocolates combination of a bunch of 12 red roses with a small cadbury celebration pack! . 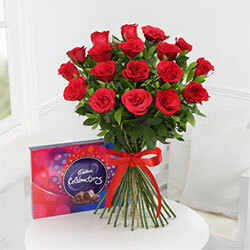 Bunch of 12 red roses,2 dairy milk chocolates. 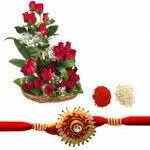 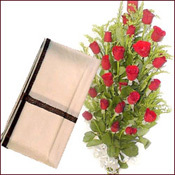 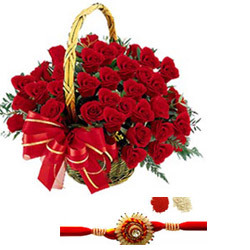 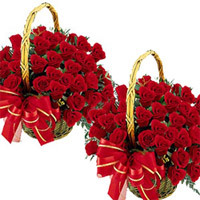 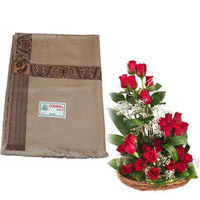 20 Red Roses in around basket with Designer Rakhi and Roli Chawal. 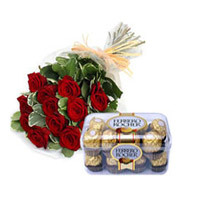 Bunch of 12 Red Roses & 16 Pcs Ferrero Rocher . 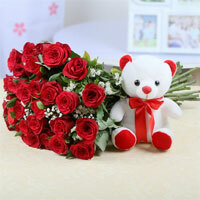 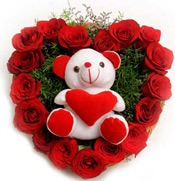 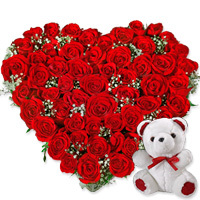 A cute Teddy of height 10" with Bunch of 10 Red roses with seasonal fillers + 1 Kg. 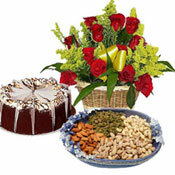 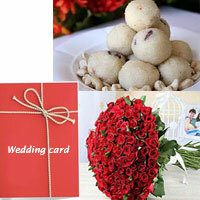 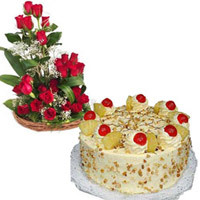 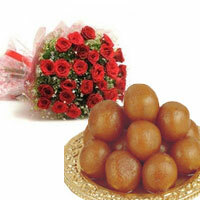 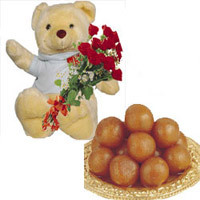 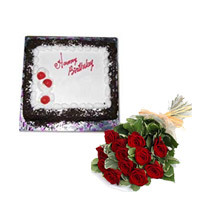 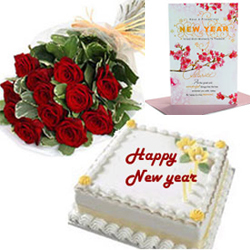 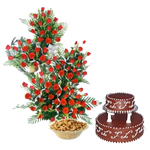 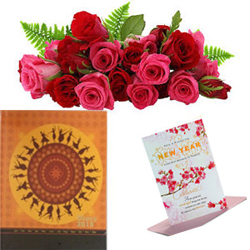 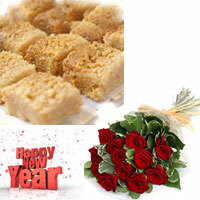 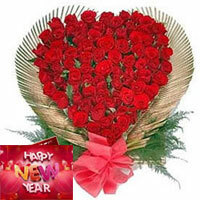 Gulab Jamun New Year Greeting Card to carry your message..
20 Red roses basket 1 kg Kalakan. 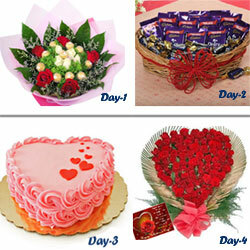 7 Red Roses 10 Cadbury Dairy Milk chocolates Tied with Red Ribbon One Heart Shaped I Love You Tag or balloon. 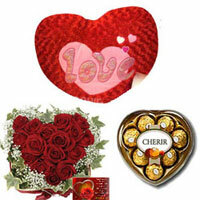 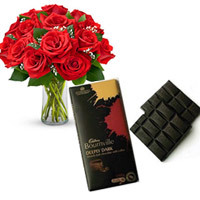 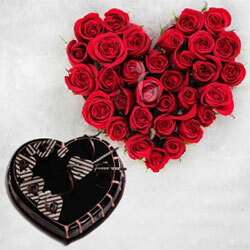 12 Beautiful red roses basket 16Ferrerro chocolates Gift this Special Hamper on this Valentine's Day to your beloved. 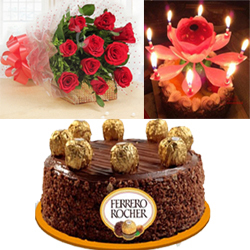 Comprising of A Basket of 50 Red Roses and a Pack of 24 Ferrero Rocher Chocolate.
" 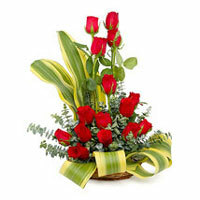 Nice basket arrangement of 24 Red roses with green leaves and fillers. 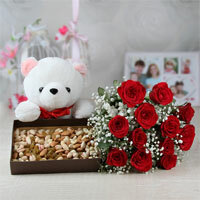 16:ins teddy Bear. 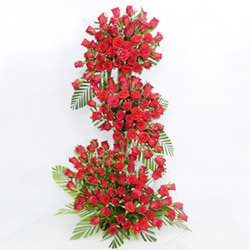 A cute Teddy of height 16" + 36 Pink roses has earned an apt name owing to the spectacularly arranged fresh red roses coupled with the (color & design of teddy may vary as per availabilty). 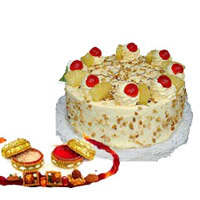 1 kg Round shape one kg butter scotch cake. 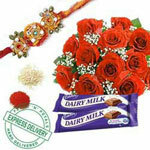 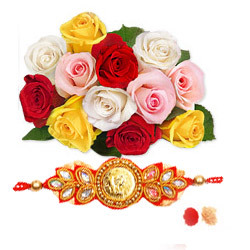 Other Flavours also 6 red roses bunch designer rakhi with roli chawa. 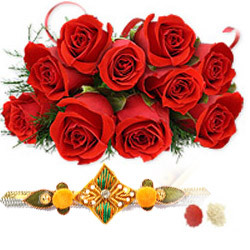 12 red roses bunch Rakhi with RoliChawal.. 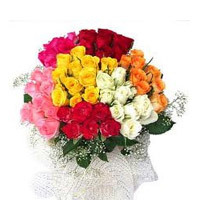 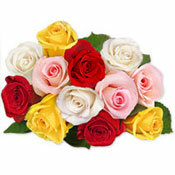 Bright 12 multi coloured roses in a bunch is all about unending happiness Rakhi with RoliChawal.. 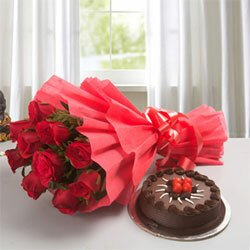 Bunch of 24 red roses wrapped with net and a ribbon bow. 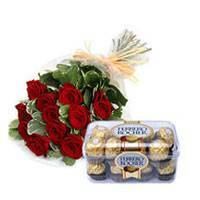 Rakhi with RoliChawal..
Rakhi N Ferrero Rocher Hamper. 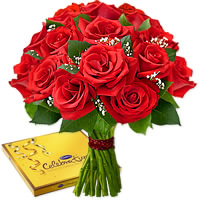 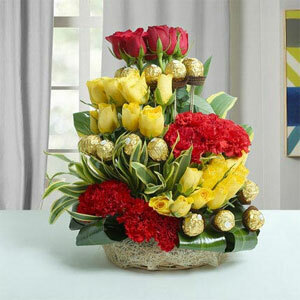 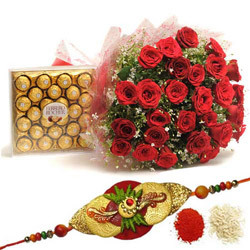 30 premium long-stem red roses are hand bunch With Ferrero Rocher 300gm & Rakhi with Roli chawal..
50 Roses basket to your loved one in India You can be sure that this enchanting rose basket and Rakhi with roli chawal..
A bunch of 10 red roses in a red paper packing paper with a red ribbon bow, 500 gm Pineappale cake teamed up with a greeting card as per occasion. 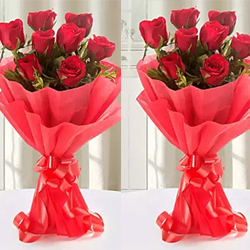 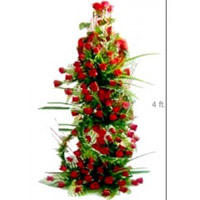 A cute Teddy of height 16" 75 Red roses has earned an apt name owing to the spectacularly arranged fresh red roses coupled with the (color & design of teddy may vary as per availabilty) . 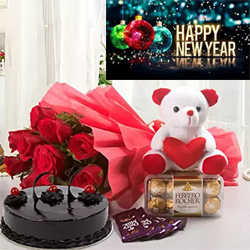 Bunch of 12 Red Roses & 16 Pcs Ferrero Rocher Delicious Cadbury celebrations Cashew Weight 175gr & small teddy bear 6inch height. .
12 of the finest red roses are complemented by delicate gypsophila with small teddy Bear with free rakhi . 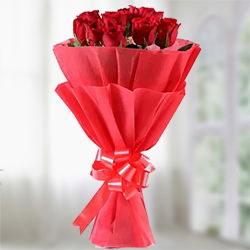 Bunch of 12 Red Roses with seasonal fillers wrapped in cellophane. 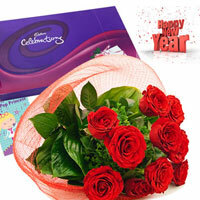 1/2kg Ajmeri Kalakan + Bunch of 20 Red Roses with green leaves coupled with Cadbury's Celebrations Pack. 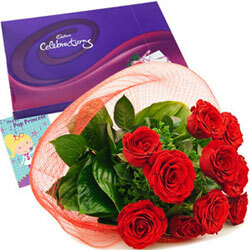 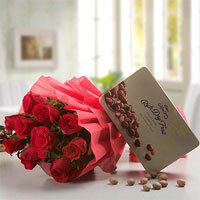 Bunch of 20 Red Roses with green leaves coupled with Cadbury's Celebrations Pack to express your heartfelt feelings . 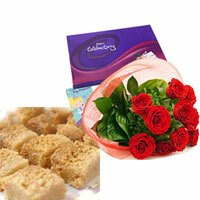 1/2kg Ajmeri Kalakan sweets tempts everyone, 10 red roses bucnh. 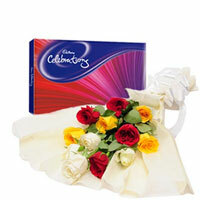 Bunch of 12 Red Roses with green leaves coupled with Cadbury's Celebrations Pack to express your heartfelt feelings . 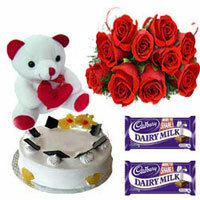 10 Red roses bunch 1kg black forest cake small teddy 2Cadbury Dairy Milk.Chocolates . 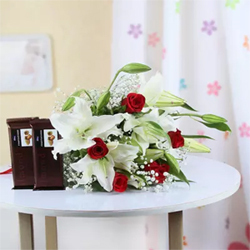 Your loved ones will be highly gladdened by you, when they receive this adorable gift from you 5 White Lilies With 5 Red Roses+Temptation Chocolates 72gms (2 units). 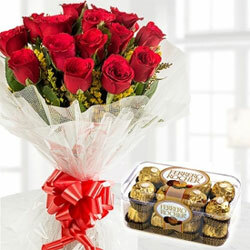 16 Pcs Ferrero Rocher chocolates box 12 Red roses bunch . 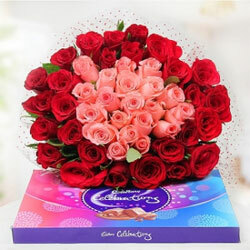 Bunch of 12 Red Roses in cellophane Packing with red ribbon bow and box of 126gms cadbury celebration chocolate small teddy . 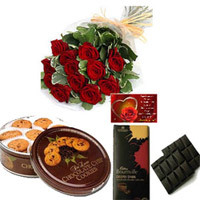 30Red roses Heart Basket Beautiful soft 'Red Heart Heart shape Cherir Heart chocolates box . 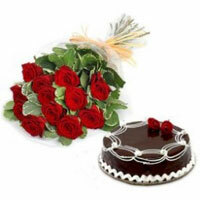 20 Red Roses along with a 1 kg butterscotch cake. 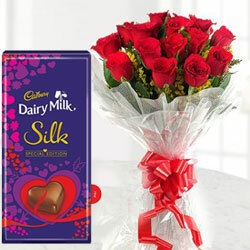 As flowers express one's heart-felt feelings in an unique fashion Cadbury Dairy Milk Silk (4 Flavors) each one 65 gms . 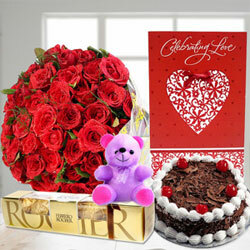 12 Red Roses bunch & 16 Pcs Ferrero Rocher + 1kg chocolate cakes small teddy . 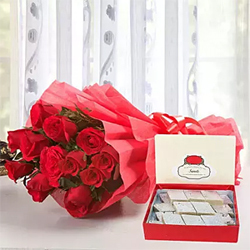 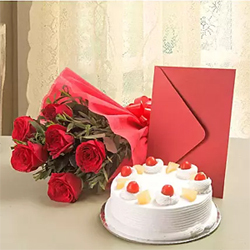 A bunch of 12 beautiful red roses packed in a brusque paper with a red ribbon 500 gm Kaju Katli box is also included to celebrate the occasion with sweetness. 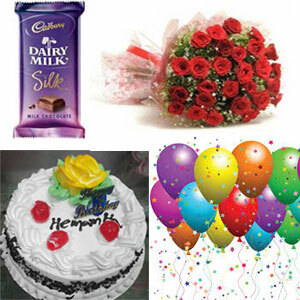 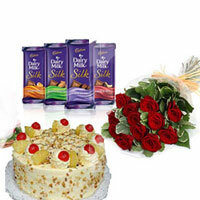 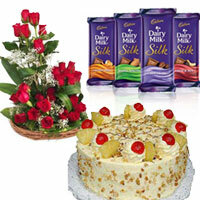 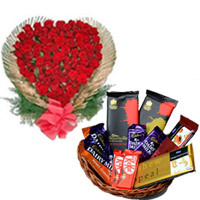 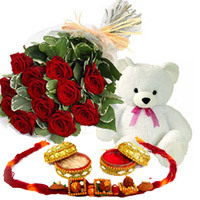 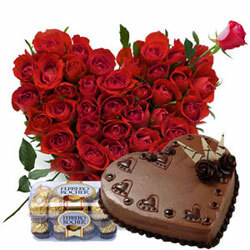 Rakhi, 16pc Ferrero Rocher Chocolates 200g, 250g Kaju Katli Sweets, Bunch Of 6 Red Roses. 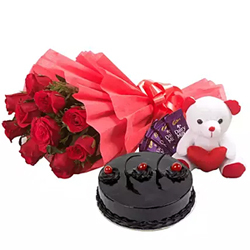 Note: The design and color of rakhi may vary depending upon the local area of delivery..
1Kg Round black forest cake + 15 Red roses one side basket + flower candle . 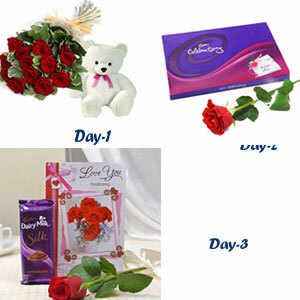 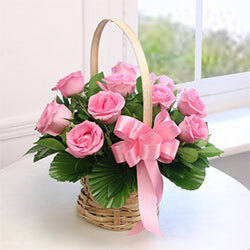 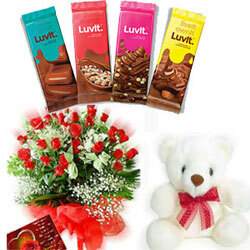 Your Gift Contains: Day 1: Bunch of 12 Pink Roses, 2 Cadbury silk chocolates and 6 inches teddy bear. 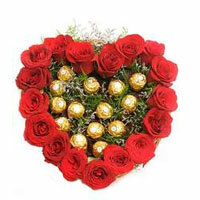 Day 2: Bunch of 12 Red Roses with 200grams Ferrero Rocher.. 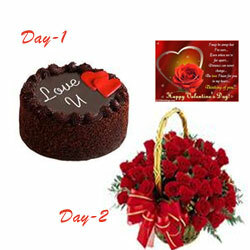 Your Gift Contains: 1st Day: 1 Kg Round Chocolate Cake 2nd Day: 50 red roses Round Basket. 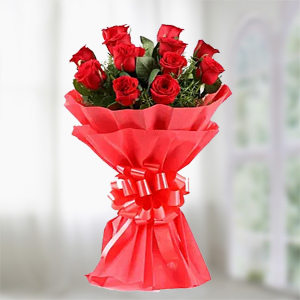 Your Gift Contains: Day 1 :12 Fresh Red Roses Flower Bunch Day 2 :30 Red Roses Round Basket Day 3 :60 Fresh Red Roses heart shape basket . 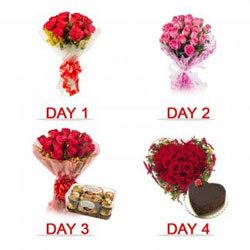 Day 1 : 16 Ferrero Rochers chocolates in Red Handmade Bouquet Day 2 : A Couple of cute teddies, height 10ins Day 3 :50 Fresh Red Roses Bunch. 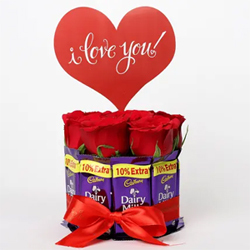 Day 1 : Express your long time love Cadbury silk chocolate weighing 60 gm with a love card Day 2 :12 Red Roses bunch and 6 inch teddy+Day 3 :Cadbury Celebration Gift Pack. 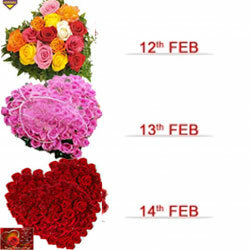 12th Feb (Day 1): 35 Mixed-color Roses in a heart-shaped basket 13th Feb (Day 2): 35 Pink Roses heart-shaped basket 14th Feb (Day 3): 35 Red Roses heart-shaped basket. 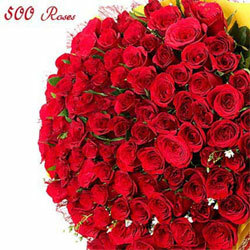 500 Red roses bunch Valentine's Day. 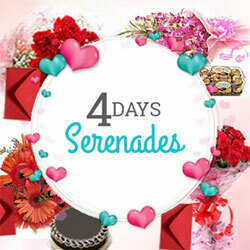 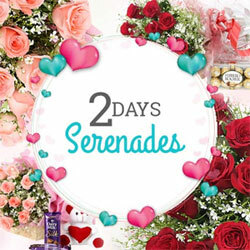 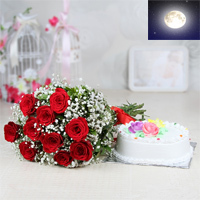 Send her a Bunch of crimson Red Roses which will make her feel that you will continue to love her more and more with each passing year. .
4 Day Serenade Surprise. 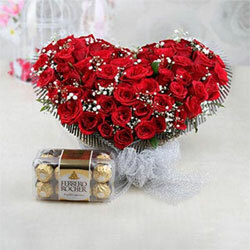 Day 1: 12 red rose Bunch Day 2: 12 pink rose Bunch Day 3: 20 red roses with pack of 16 Ferrero Rocher Day 4: 30 red roses In heart shape with 1Kg chocolate Heart-Shaped Cake . 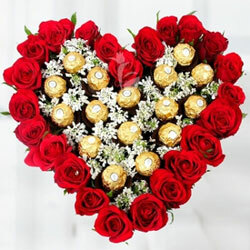 Day 1 : 16 Ferrero Rochers chocolates Bouquet Day 2 : Cadbury Dairy Milk Chocolates - 12 (13 grams) 30 pcs Cadbury Chocolairs Day 3 :1kg heart shape strawberry cake Day 4 :50 Red roses heart shape basket . 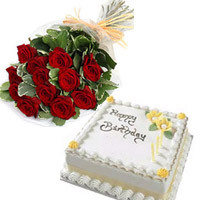 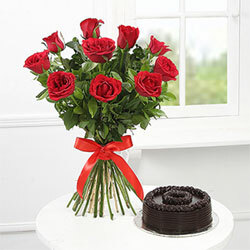 10 Red roses bunch Dukes 1/2kg Round chocolate cake . 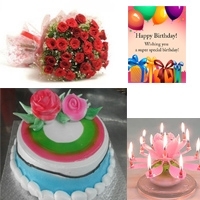 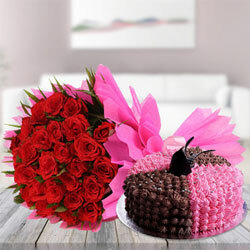 25 red roses in 2 layer pink paper packing and Sizzling Chocolate Strawberry Cake 1kg. 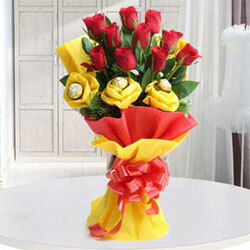 18 Red Roses in 2 Layer Red and Yellow paper packing and 2 Cadbury Silk Chocolate - wt 70 gm each Create an atmosphere of love and happiness. 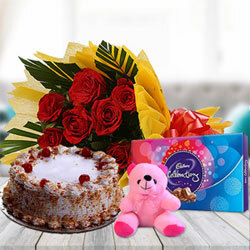 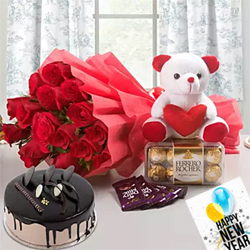 500 gms Black forest cake, 10 Red Roses in blue paper packing,Small Teddy Bear and 5 dairy milk chocolates Show your crazy love with a combo gift. 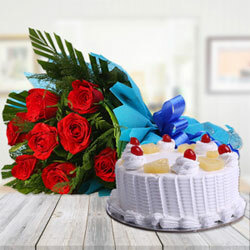 10 Red roses in blue paper packing and 1/2kg pineapple cake . 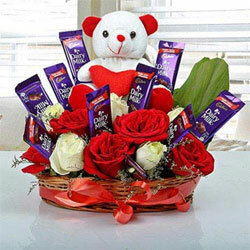 This combo comprises of: 12 red roses bunch -5 Cadbury chocolates -6-Inch teddy. 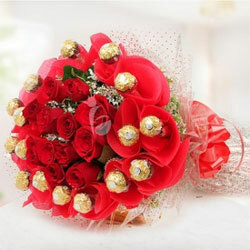 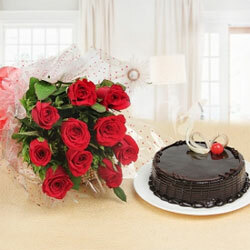 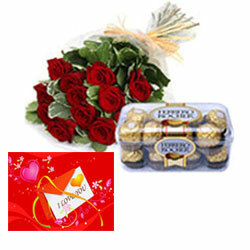 This perfect combo comprises of: 12 red roses bunch - 16 Pcs Ferrero Rocher box. 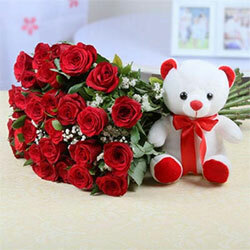 Bunch of 12 Red Roses with 10 ins Teddy Bear & Assorted Chocolates 5nos. 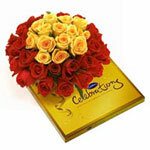 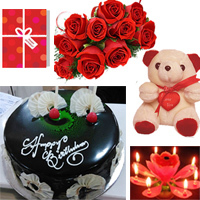 10 Red roses in yellow paper packing + 500 Gms butterscotch cake + celebrations pack big pack + small teddy . 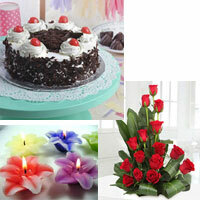 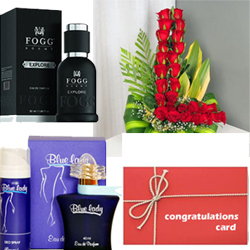 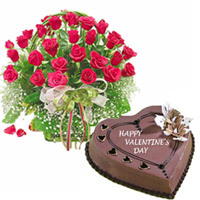 Valentine's crave for love and more to that, it seeks for the oddest expression of love. 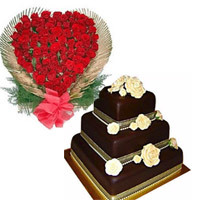 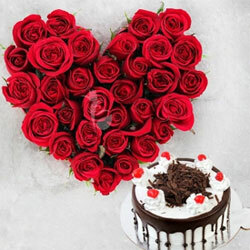 35 red roses heart shape arrangement with half a Kg black forest cake . 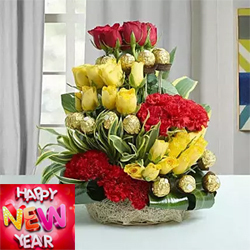 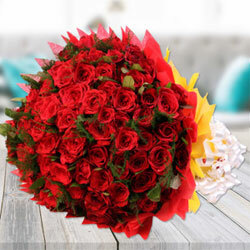 25 fresh Red Roses with seasonal-fillers in a heart-shaped arrangement along-with 16 Ferrero Rocher chocolates in the center of the arrangement. .
10 fresh Red Roses along with 16 pcs Ferrero Rocher chocolates arranged in a bunch bunch. When a bunch of 10 ravishing Red Roses come together in such beautiful wrapping. 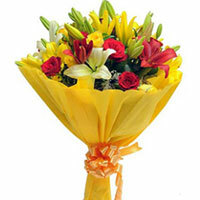 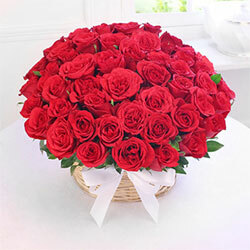 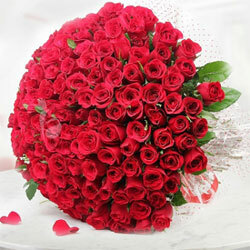 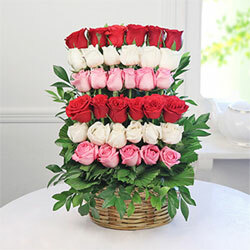 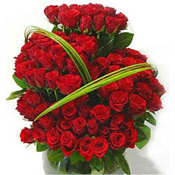 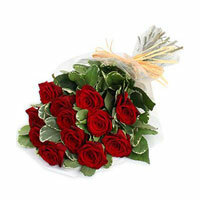 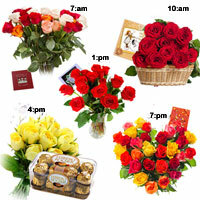 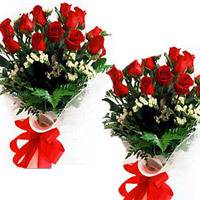 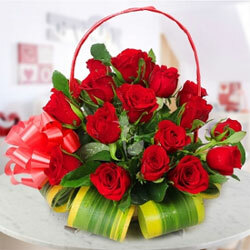 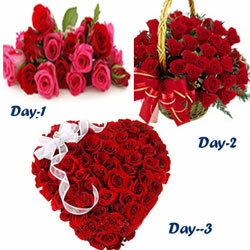 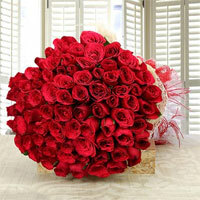 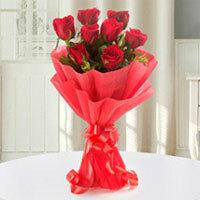 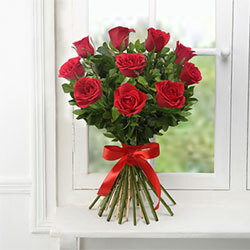 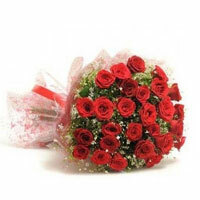 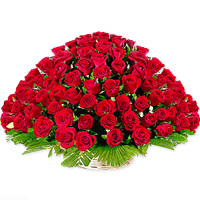 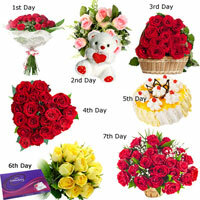 Roses are known as an epitome of love, so why not gift a huge set of 25 red roses to your loved one.. 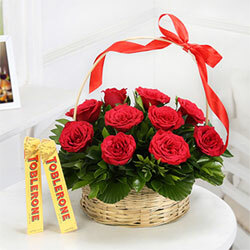 Basket of 12 Red Roses with 2 Bars of Toblerone. 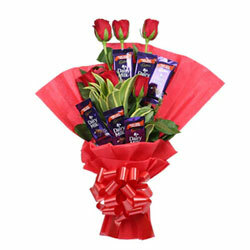 Bunch of 10 Red Roses with 5 Cadbury Dairy Milk Chocolates. 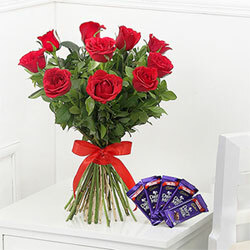 6 Cadbury Dairy Milk Chocolate 12.5gm 6 Red Roses Red Paper Packaging Red Ribbon Seasonal Leaves. 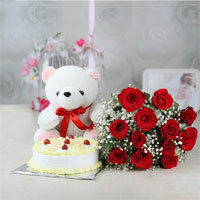 12 Red Roses Bunch, 1/2kg Normal Chocolate Cake and Small n Cute Teddy Bear. . 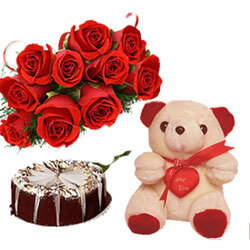 Arrangement of 7 Red Roses, Cadbury Bournville Cranberry Chocolates - 80 grams, Teddy Bear - Height 6 inches. 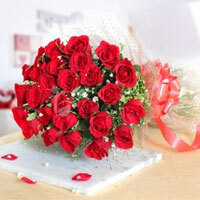 37 red roses are arranged in the shape of two hearts so it expresses your emotions to your loved ones.. 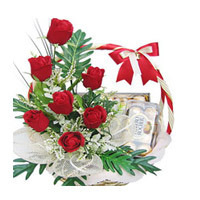 When a bunch of 10 ravishing Red Roses come together in such beautiful wrapping,. Bouquet of 12 Red Roses Small White Teddy Bear + Cadbury Dairy Milk Chocolates - 5 (12.5 grams each)+Truffle Cake - 500 grams. 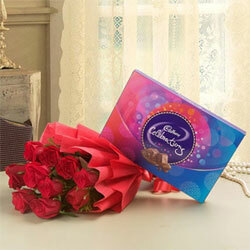 Bouquet of 10 Red Roses Cadbury Celebrations Chocolate Box - 131.3 grams. 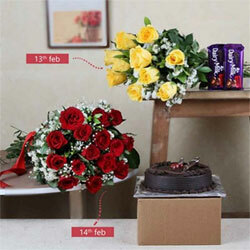 1pcs cadbury dairy milk silk valentines edition +12 Red roses bunch Out of Stock. 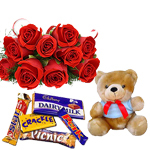 12 Red roses bunch + Cadbury Dairy Milk Silk Valentine Special edition+Ferrero Rocher 16 Pieces pink Teddy Bears are the most lovable soft toys 14 to 16 inchs.